Driving under the influence of alcohol, excessive speed, getting distracted by smartphones and other electronic communication systems, and lots more: The human factor plays a key role in road accidents. Almost 90% of accidents in Europe can be attributed to human error, which means that efficient measures aimed at eliminating this problem are indispensable. As much as vehicle technology and road infrastructure can help to prevent risky situations from arising in the first place or mitigate the consequences of accidents, the most important factor is the human factor: Responsible behavior, a proper assessment of one’s own capabilities and a high level of acceptance of rules among all road users are absolutely essential. The numbers are worrying: According to the National Highway Traffic Safety Administration (NHTSA), one person is killed on US roads every 51 minutes in accidents in which one road user had a blood alcohol concentration of 0.8 or more. In 2015, the total number of traffic fatalities in the USA was almost 35,100, 10,265 of whom – that is, almost 30% – were killed in accidents in which alcohol was a factor (blood alcohol concentration of 0.8 and more). While this percentage sank continuously between 2006 and 2011, it has since remained at roughly the same level. And things don’t look much better in other countries either. According to the World Health Organization (WHO), and insofar as national figures are available, this black list is headed by South Africa with 58%, followed by Uruguay with 38% and Vietnam with 34%. In the EU, drunk driving was responsible for around 6,500 deaths in 2015 – that’s around 25%. The differences between the figures among the individual member states are relatively large. In 2015, Germany recorded 256 deaths caused by drunk driving (7.4%), while France recorded 866 (25%). In Estonia and Latvia, however, almost one in two traffic fatalities was the result of drunk driving. For several years now, various countries have made attempts to introduce a technical solution to prevent alcohol-related accidents: the alcohol interlock, an immobilizer that is built into the car and allows the engine to be started only when the driver has given a breath sample containing no trace of alcohol. This system helps to prevent drunk-driving by stopping people who have consumed alcohol from being able to start the engine in the first place. Alcohol interlocks are currently used worldwide for primary and secondary prevention purposes. One example of primary prevention by means of alcohol interlocks is offered by a Dutch transport company, which has had breath-alcohol-controlled immobilizers installed in all vehicles as a way of enforcing a zero-tolerance policy toward alcohol among its drivers. The working conditions of truck drivers in particular, who carry out their duties under intense time pressure and frequently alone, can put them at risk of using alcohol to “switch off” during rest periods. If people drink more alcohol in the evening, they often underestimate how long it takes for the alcohol to be metabolized in the body, which means that they may still have residual alcohol in their blood the next morning. Despite initial skepticism among some of the company’s drivers who felt that they were being watched, immobilizers have become standard and helped to promote a more responsible attitude toward alcohol than before. In addition to direct improvements for the safety of the drivers and other road users, the logistics company has also seen business benefits thanks to less vehicle damage, which, in turn, is advantageous in the company’s dealings with its insurance company. Alcohol interlocks act as a secondary prevention measure when they are installed in the vehicles of known drunk-drivers, that is, as part of “offender” programs for drivers who have been stopped or convicted for drunk-driving. Such programs are currently in place in the USA, Canada and Australia as well as in some European countries (Finland, Sweden, Norway, Denmark, Belgium, France and Poland and as a research project in Austria). 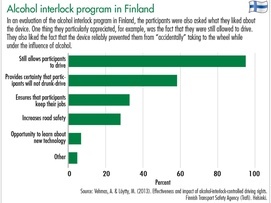 In a report published in 2013, the Finnish traffic authorities detailed their experiences with the alcohol interlock program. In the period under analysis (2008-2012), an alcohol interlock had been fitted in the vehicles of 1,687 drivers. Once a driver has been convicted of drunk-driving, a court decides upon a “probation period” of one to three years with the alcohol interlock; in Finland, the costs of €110 to €160 per month are paid by the convicted person themselves. The parameters are adjusted in line with the application in question and according to the statutory requirements in the countries in which alcohol interlocks are used. 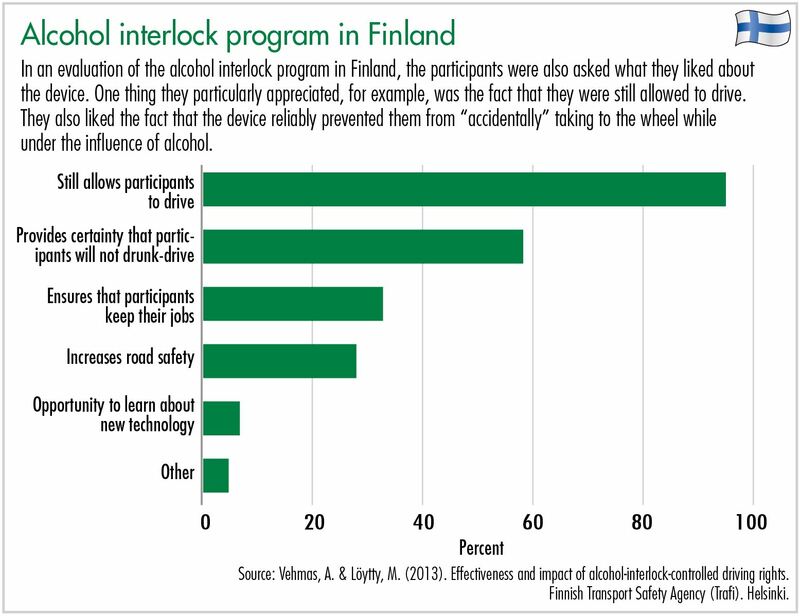 In Finland, for example, the interlocks have been calibrated such that they prevent the engine from being started when a blood alcohol concentration of 0.2 or more is detected. This tolerance range is necessary because eating certain foods can cause the body to produce small amounts of alcohol without any alcohol actually having been drunk. When the engine is turned off, it can be restarted within five minutes without the driver having to provide another breath sample. If a participant fails to stick to the rules of the alcohol interlock program, for example by driving a car that is not specified on their driver’s license, attempting to manipulate the alcohol interlock or driving another vehicle under the influence of alcohol, they will have their driver’s license withdrawn. This is also the case if the participant decides that they no longer want to take part in the program. 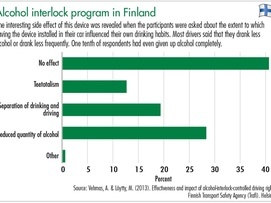 Of the more than 19,000 people convicted of drunk-driving in Finland in 2012, 511 volunteered to take part in the alcohol interlock program. 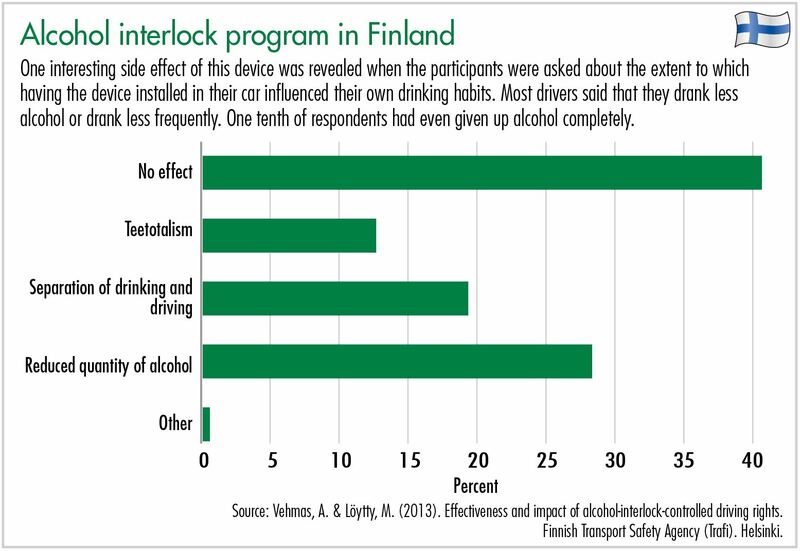 As a sign of the program’s success, just 5.7% of all participants were re-arrested for drunk-driving either during or after the end of their “probation period.” This form of legal probation is therefore much more effective than for drunk-drivers without an alcohol interlock, of whom 29% to 30% in Finland re-offend. Twenty-four people died while the alcohol interlock was in use, with 37.5% of deaths the result of alcohol poisoning and alcohol-related illness.